Right now, as autumn descends upon the Northern Hemisphere, many animals are preparing for the frigid and lean winter months. Bears are going through a serious bulking phase. Hares and stoats are changing the colors of their coats. Oh, and shrews’ heads are shrinking. New research shows that the skull of at least one variety of shrew actually shrivels in size every winter. The research team, led by scientists at Germany’s Max Planck Institute for Ornithology, not only discovered that the shrews sport this surreal, skull-wilting ability, but that they shrink their skulls repeatedly and on a seasonal cycle. The shrews’ skulls shrink during the winter, but then miraculously grow back nearly all their original mass in the spring and summer, according to new research published today in the journal Current Biology. This sets the shrews up to do it all over again at the end of the year, which honestly sounds like they’ve been saddled with some cruel, recurring witch’s curse. There was some initial inkling that a seasonal pattern was at play. Scientists had previously described an odd relationship between skull size and season in some shrew and weasel species, where winter was full of individuals with smaller skulls, and summer was dominated by animals with comparatively voluminous noggins. This observation—termed “the Dehnel phenomenon”—was first reported by Polish zoologist August Dehnel in the early 20th century, and alternatively sounds like the title of next summer’s poorest performing young adult science fiction film. Generally, it was thought that the Dehnel phenomenon was produced by population filtering effects of the passing seasons, where larger individuals (with larger heads) simply didn’t live through the winter as readily as their smaller compatriots. This is an understandable hypothesis to make, considering the other option was that shrews were expanding and contracting their skulls like a slowly beating heart. This is objectively crazier, and also, in one of nature’s lovely twists, apparently the accurate explanation. By tracking the skull measurements of wild common shrews (Sorex araneus) over the course of a year, the researchers were able to show how individual shrews shrank and regrew their skulls. They trapped shrews and took detailed x-ray measurements of their skulls. Before being released back into the wild, the shrews were also anesthetized and implanted with a microchip, allowing for identification of specific individuals for any recaptures. The research team was able to recapture a dozen shrews at three points over the year—winter, spring, and summer—and measure their skulls at each timepoint. The shrews experienced some rather incredible changes, losing as much as 20 percent of their skulls in the winter months, and regaining 15 percent later in the year. The recaptured shrews all showed the same annual pattern: the skulls were largest in the summer, waned in the winter, and then rebounded in the spring. Much of the shrinkage occurred around the shrews’ braincase, substantially flattening its roof. It’s not yet known how the shrews are able to accomplish this. It’s possible that tissue where skull bones meet is reabsorbed, shrinking the braincase volume, and then regenerating those same sutures in the spring. This is obviously awesome and weird as hell, but...why? The answer may reside in other anatomical seasonal changes. Alongside the shrinking skulls, shrew brains lose a hefty portion of their mass, and there is also winter reduction in organ size and spine length. In this study, the shrews managed to lose about a fifth of their body mass overall. This rollback on specific areas of the shrew bod’ might be an energy-saving adaptation, throttling down disproportionately calorie-sucking apps like brains. Shrews don’t hibernate or migrate, so they have to overwinter as is—which is a condition not well-suited for times of wintertime food scarcity. 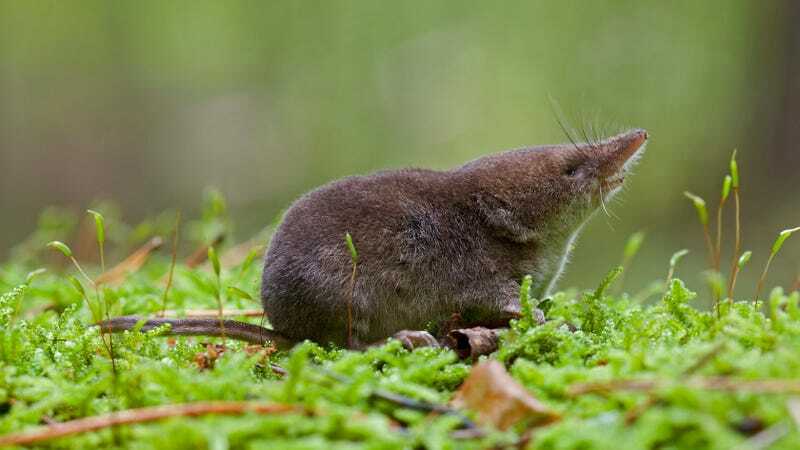 Shrews may look like mice, but they are close relatives of moles and hedgehogs, are voracious invertebrate-devouring mini-predators, and have famously-extreme metabolic rates—sometimes requiring their own body weight or more in food daily. Mercilessly cutting back on energy output by downgrading whole organs might be the only way these little guys can make it through winter without starving. Whatever the reason for this seasonal shrinking, figuring out how shrews pull it off may be of importance to humans. The researchers note that if shrews can reverse their own bone loss, we could potentially co-opt the process for treatment of degenerative bone diseases in humans. Jake Buehler is a Seattle area science writer with an adoration for the Tree of Life’s weird, wild, and unsung—follow him on Twitter or at his blog.